This symposium on plasma Supply Management was prepared by the so called TS093 working party and consisted in a 2 day meeting with the goal to collect evidence based data to support the revision of the text of the recommendations to be published in the 20th edition of the Guide concerning plasmapheresis donor selection, donor protection and donor management in order to collect plasma for fractionation. 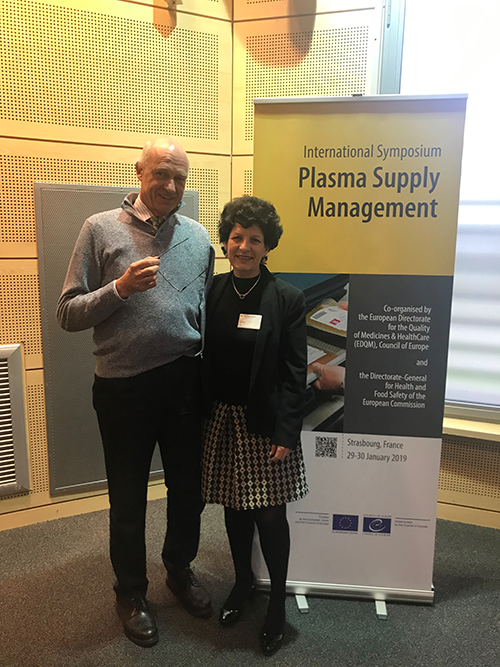 The meeting contributed to the evaluation of the state of plasma collection in Europe and provided an opportunity to assess strategies to optimize it. The different stakeholders committed in the sector were invited to take part and patients were given the floor for the first time ever in such a meeting. Our colleague Frank Willersinn from Alpha-1 Global had the opportunity to present the current situation and future needs for patients in need of plasma derived medicinal products on behalf of PLUS – the Platform of Plasma Protein Users. In that perspective, PLUS had had a meeting a week earlier and issued a statement (read more here). Obstacles to strategic independence of plasma for fractionation in Europe and way forward: Is the EU legislation/regulation itself a barrier in any way? Efficiency of collection practices – how can obstacles be resolved? 1 The Council of Europe is the continent’s leading human rights organisation that includes 47 member states, 28 of which are members of the European Union. The EDQM is a leading organisation that protects public health by enabling the development, supporting the implementation, and monitoring the application of quality standards for safe medicines and their safe use which are recognised as a scientific benchmark and applied world-wide. 2 European Directorate for the quality of Medicines and Healthcare – The EDQM develops guidance and standards in the areas of blood transfusion, organ, cell and tissue transplantation and consumer health issue that have an impact on public health in Europe and beyond. • the need for education: it is essential to make people aware of the critical need in plasma for patients living with rare plasma related disorders such as primary immunodeficiencies among others. What are the next steps? A draft text of the blood guide should be submitted to public consultation by May/June 2019 – comments will be accepted until August. Then the comments will be classified in 3 groups: A for “integrated”, B for “needs further discussion, not integrated”, and C for “not taken into account”. Feedback will be given in each case. The final document is likely to be issued by end of November 2019 and formally adopted by CD-P-TS (European Committee on Blood Transfusion) by the end of 2019. IPOPI and PLUS will continue to actively monitor this development and provide further input wherever possible to ensure a patient-centred approach and hopefully patient-centred outcomes.